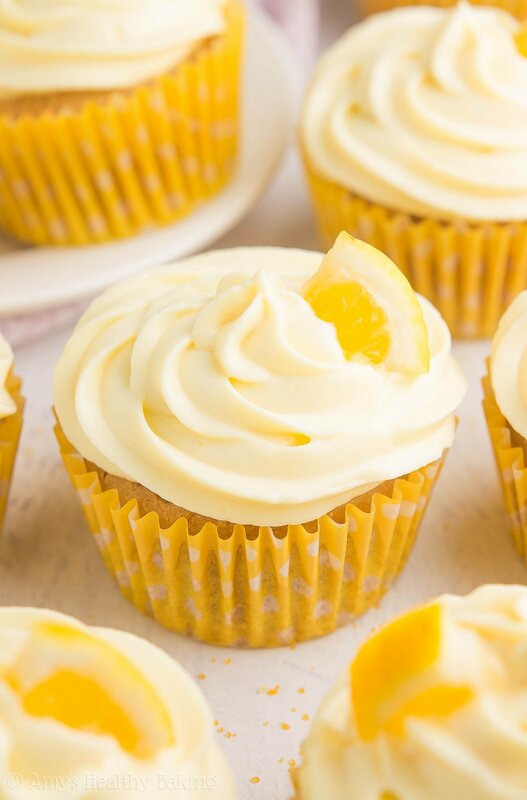 Guilt-free lemon cupcakes topped with sweet swirls of lemon frosting! Easy to make & secretly healthy with no refined flour or sugar & just 128 calories! A few times during our childhood, Mom created an elaborate semi-homemade birthday cake for my brother, along with our help. We picked out a magazine with the cake layout my brother wanted at the grocery store, usually something like Women’s Day, and we purchased the rest of the necessary ingredients during that same trip. The recipes usually started with a boxed mix (Mom practically refused to bake anything from scratch except cookies! ), split into three round pans to create a taller cake. While those cooled, we dyed some of the canned vanilla frosting blue with food coloring and prepared the fun embellishments. Once Mom assembled the three layers, we spread plain vanilla frosting across half of the top of the cake, followed by the freshly dyed blue frosting on the remaining half and around the sides. We pressed small Goldfish crackers into the sides to make it appear like they were swimming in circles around the cake, and then we started decorating the top. 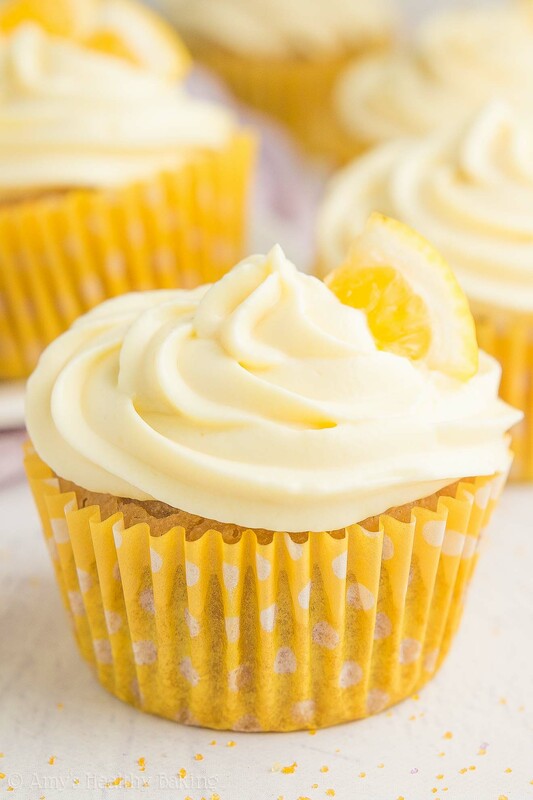 Although everyone would love making another one of those cakes for old time’s sake, my brother probably couldn’t enjoy it because of the many food allergies he has developed over the years… So I made these Healthy Lemon Cupcakes with Lemon Frosting for him instead! Lemon is his all-time favorite cake flavor, and he said these were absolutely full of that bright sunshiny flavor. Even better? They contain no refined flour or sugar and only 128 calories! I don’t need a birthday as an excuse to celebrate that! ?? This healthy lemon cake base starts with white whole wheat flour (like this). White whole wheat flour is made exactly the same way as regular whole wheat flour! It just comes from a special type of soft white wheat, whereas regular whole wheat flour is made from heartier red wheat. 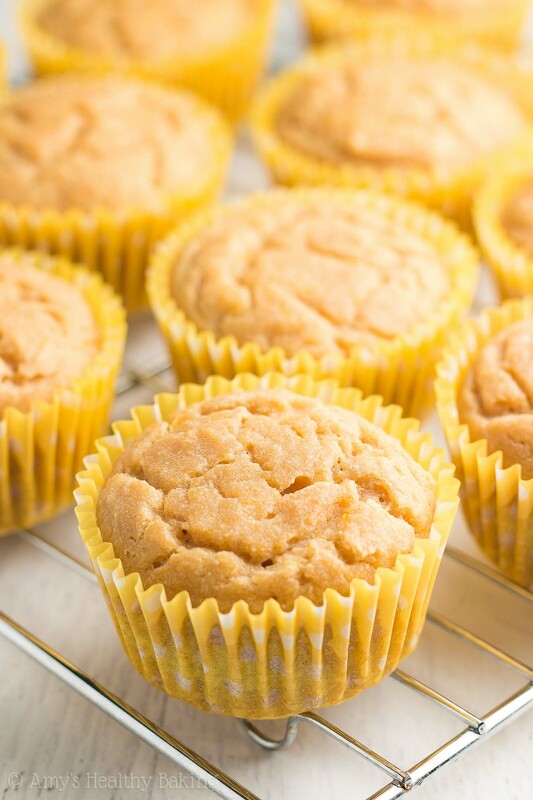 This gives white whole wheat flour the same health benefits as regular whole wheat flour, but with its lighter taste and texture, it’s perfect for these cupcakes! With just 1 tablespoon of butter or coconut oil, you’ll mix Greek yogurt into the batter for the rest of that classic tender cupcake texture. If you’ve been around my blog for a while, you know how much I love Greek yogurt! 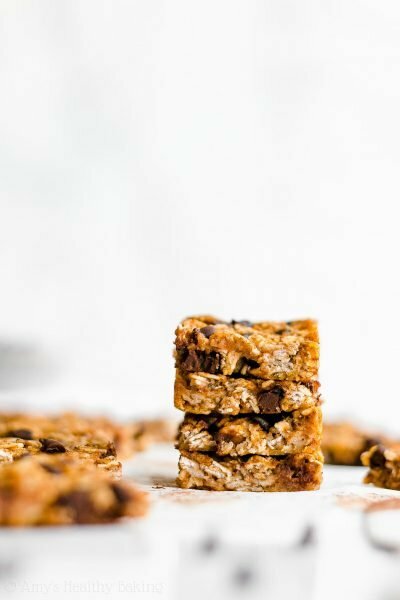 It adds the same moisture as butter or oil for a fraction of the calories, and it gives your baked treats a protein boost, too! 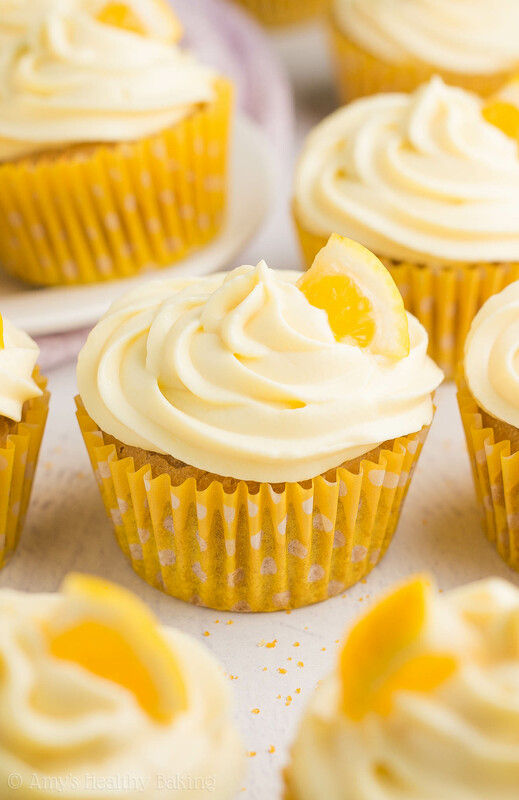 Of course, we can’t forget the true star of these cupcakes… The lemons! 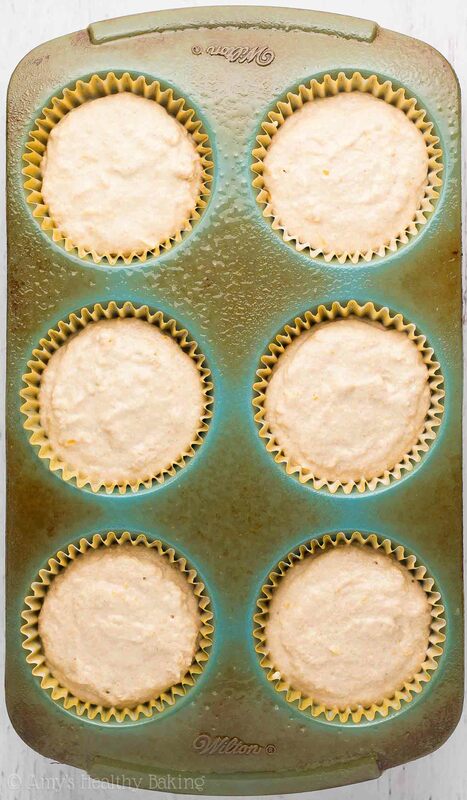 You’ll use both lemon zest and freshly squeezed lemon juice in the cupcake batter. The former actually provides the majority of the citrus flavor, so don’t skimp on it! If you can find Meyer lemons, I highly recommend them. They’re brighter and sweeter than traditional lemons! Now this frosting has a secret… It’s actually made from more Greek yogurt! And because of that, you’ll use lemon extract (like this) to flavor the frosting. No lemon juice here—that would just make the yogurt curdle! To make the frosting stiff enough to pipe into those elegant swirls, you’ll beat the Greek yogurt with instant vanilla pudding mix (like this). Such a fun and nifty trick! Happy birthday, bud! ??? And when you make your own, remember to snap a picture and share it on Instagram using #amyshealthybaking and tagging @amyshealthybaking IN the photo itself! (That guarantees I’ll see your picture! ?) I’d love to see your cupcakes and feature them in my Sunday Spotlight series! 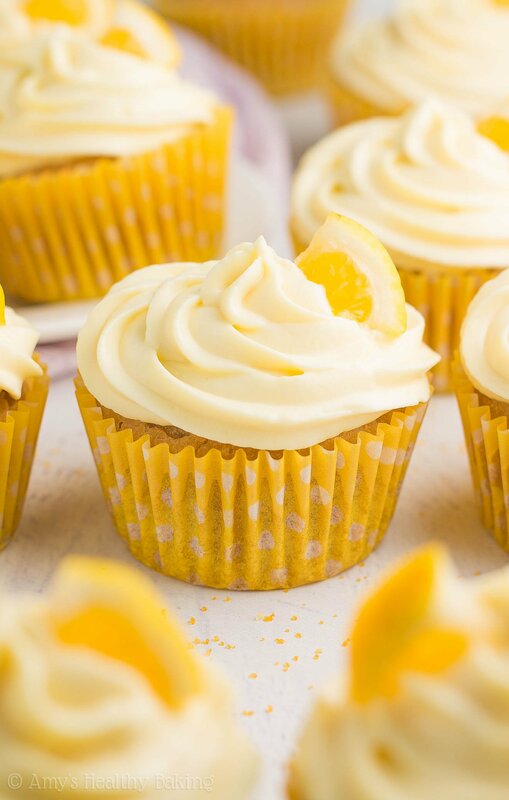 These cupcakes are perfect for anyone who loves lemon! My brother absolutely loves them, and lemon is his all-time favorite cake flavor. 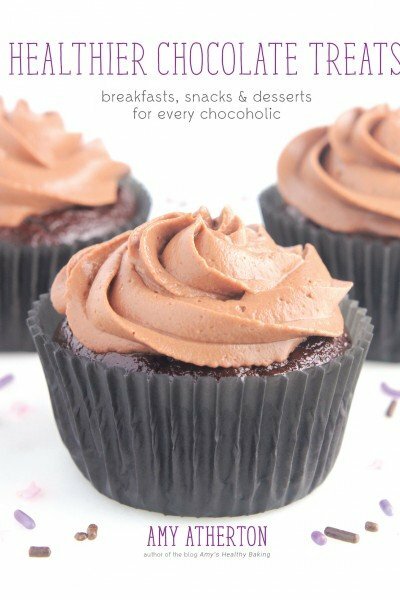 The cupcakes can be made up to 3 days in advance and stored in an airtight container on the counter, and the frosting can be made up to 1 week in advance and stored in an airtight container in the refrigerator. The cupcakes are best if eaten the same day they’re frosted (and ideally, the same day they’re made, too! ), but leftover frosted cupcakes may be stored in an airtight container in the refrigerator. Divide the batter between the prepared paper liners. Bake at 350°F for 19-22 minutes or until the centers feel firm to the touch and a toothpick inserted into the center comes out clean. Cool in the pan for 5 minutes before transferring to a wire rack to cool completely. While the cupcakes bake, prepare the frosting. Add the Greek yogurt, instant pudding, lemon extract, and vanilla crème stevia to a large bowl. Beat with an electric mixer for 2 minutes. Cover the top of the bowl with foil, and refrigerate for at least 2 hours. Once the cupcakes have completely cooled, pipe the cream cheese frosting on top just before serving. Notes: Do not use a stand mixer or electric hand-held mixer for this recipe. Use a whisk where instructed and a fork or spoon for everything else. For the gluten-free flour, use the following blend: 1 ¼ cups (150g) millet flour, ¾ cup (90g) tapioca flour, ½ cup (60g) brown rice flour, and 1 ¾ teaspoons xanthan gum. Most store-bought gluten-free flour blends should work as well, if measured like this. I highly recommend using Meyer lemons, if you can find them! They’re brighter and sweeter in flavor compared to traditional lemons. I highly recommend using the vanilla crème stevia! It’s one of my favorite ingredients (you’ll use it in all of these recipes of mine! ), and I buy it online here because that’s the cheapest price I’ve found. If you prefer not to use stevia in the cupcakes, substitute ¾ cup (180mL) of agave, honey, or pure maple syrup for the vanilla crème stevia. Omit the milk and 2 tablespoons of lemon juice. (The batter should be fairly thick, similar to muffin batter.) 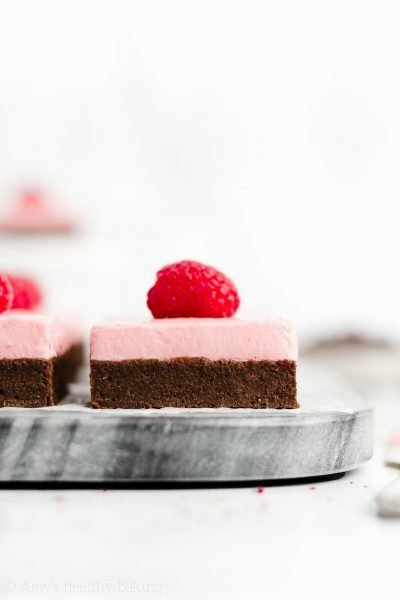 If you prefer not to use the vanilla crème stevia in the frosting, then substitute 1 ¾ teaspoons of this powdered stevia OR 6-8 tablespoons of Truvia or granulated sugar. You just need the dry instant pudding mix—don’t prepare it according to the package directions! For a spreadable (not pipe-able) frosting, you may omit the instant pudding mix. You’re using lemon extract in the frosting because lemon juice or lemon zest would cause the Greek yogurt to curdle. (Not good!) 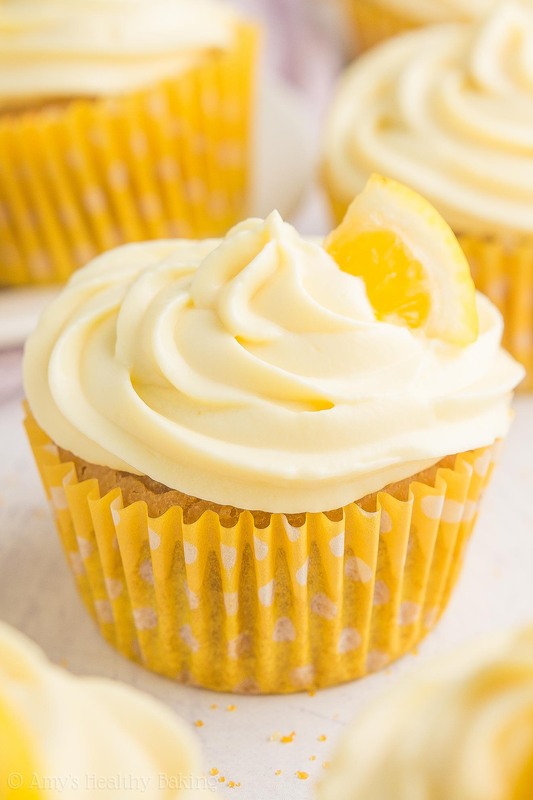 For a mellower frosting flavor, decrease the lemon extract to 1 ¾ teaspoons. 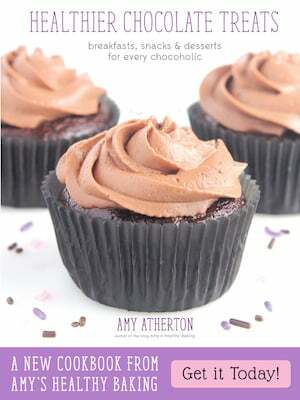 Oh Amy, these look divine! Lemon is my absolute favorite… though I went vegan a little over a year ago and now I miss your recipes. I use to love making your scones, cakes, cookies and overnight oats as well. Some things just can’t be veganized but I’d love to try and veganize this recipe, do you think flax eggs world work in place of egg whites? You’re so sweet Alison — I’m honored that you’re missing my recipes and would like to veganize this one! I don’t have much experience with flax eggs, but I do know that Ener-G will work. My brother is allergic to eggs, and that’s our favorite egg replacer. It works in just about all of my recipes! For the eggs whites in this cupcake recipe, you’d need 1 ½ tablespoons of Ener-G + 6 tablespoons of warm water. 🙂 I’d love to hear what you think if you try these cupcakes! Ah ha! You know I’ve yet to even try that stuff out…. I will definitely be taking a trip to whole foods ASAP to pick that up so I can give this recipe a go! Thanks so much, Amy!! I still have a gazillion minus 6 lemons! Hi Amy! I made these lemon cupcakes and they are perfection! The frosting is also to die for! I will be making these lemon cupcakes, chocolate chip scones, blueberry crumble, and brownies for my friend’s upcoming baby shower. Of course they are all your FANTASTIC recipes! Thanks again! I’m so glad you enjoyed these cupcakes Carmelina! That means SO much to me that you’re making four of my recipes for the baby shower. WOW!! I’m truly honored! Thank you so much, sweet friend!! Hey you need some almond flour recipes. I love so many of your recipes. 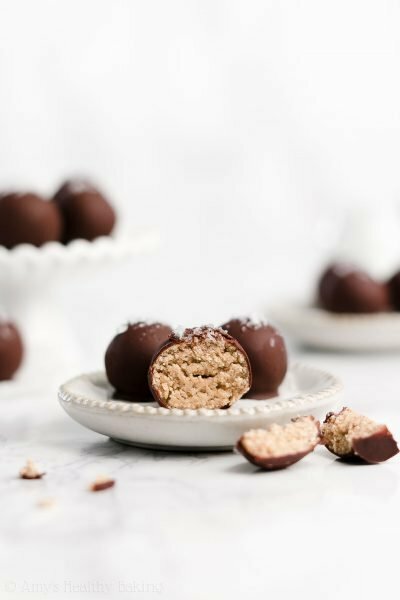 I dont like Stevia so in this recipe and others that call for it can it be substituted with real maple syrup or raw honey? Those are the only sweeteners I really use. I really appreciate your interest in my recipes Lisa! That means a lot to me. 🙂 I’ve actually included that modification already in the Notes section of the recipe, directly underneath the Instructions! It can be easy to miss. 😉 I’d love to hear what you think if you try these cupcakes! I really appreciate your interest in my recipe Rose! What sweetener did you use in the frosting? Thanks for replying. I used powdered sugar, but I think maybe it had something to do with the pudding mix? Hi Amy! These have delicious flavor but mine turned out to be a little tough and not very cake like. I’m in Japan so I used soft flour. Should I have altered since it is not all purpose? Also how whisked should the egg whites be? Could I have over whisked them? Thanks for your response. I did not over whisk the batter. I used a wooden spoon just to mix it enough, but may have whisked the eggs a little too much. I think having spoken to several people here after my failure, that the soft flour doesn’t have a rising agent in it like all purpose from the States and Australia. I’m going to try again by adding a tsp of baking powder for each cup of flour. I’ll let you know how it goes! Thanks for your response Amy! I didn’t use the vanilla stevia, just regular stevia scaled back as suggested. I don’t know, I thought, how different could they be? I measured the flour (substituted for all purpose flour) using measuring cups, just as you usually would. I appreciate your attempt to troubleshoot. I look forward to trying other recipes on the site for sure, but I’ll be mindful that for me, a healthier version of certain things maybe just aren’t for my tastebuds. I used “Now Better Stevia”and the measuring was done using scoop and level. The flavour was on the sweet side but with a bit of bitterness to it. I’m general, too overpowering. Sorry, I’m not doing the best job describing it. I need to taste them again to be more accurate. 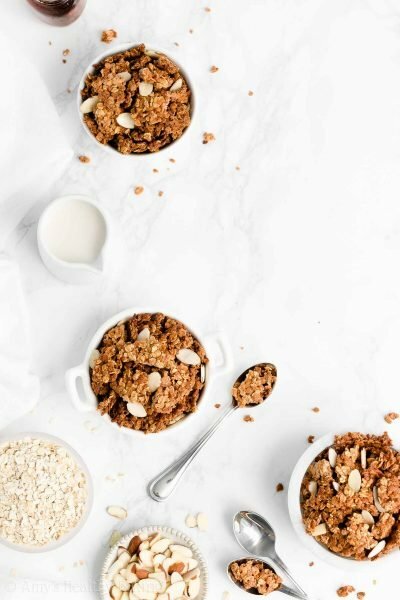 I am going to go out on limb and say that it’s the stevia – maybe I don’t find the flavour appealing and should use much less than the recipe says. Thanks Amy! No need to apologize Jamie — this is actually really helpful! I do think you’re correct in saying it’s the stevia. If you can get ahold of the exact vanilla stevia that I use, I highly recommend trying that. I’ve found that it doesn’t have the same bitter aftertaste that other brands often have, so that might be really helpful for you! I tried these out last night and they turned out terribly. They were super bitter and I had to toss out the whole batch. I assume it was the stevia? I really appreciate your interest in my recipe Katie! That sounds disappointing, but I’m happy to work with you to figure out what happened. 🙂 Did you make any substitutions to the recipe, including those listed in the Notes section? Did you use the same stevia that I did?